Vitamins in the Air, absorb more with Teviron. : Do you know anyone who has Nasal allergies and allergic Asthma? Do you know anyone who has Nasal allergies and allergic Asthma? Do you know anyone who is suffering from Nasal allergies and had to endure the following pains? 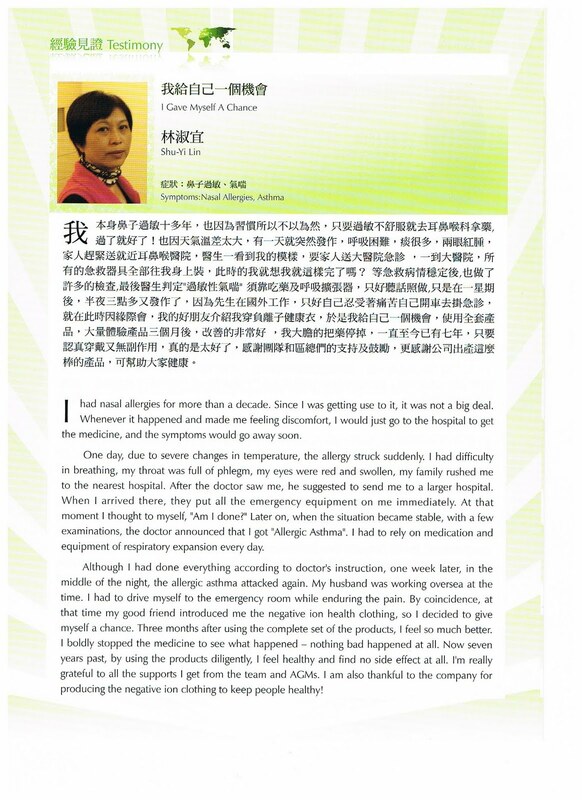 Now, by giving herself a chance and wearing the Nefful full set of teviron clothing for the past seven(7) years, Lin Shu-Yi feels healthier and thankful each day. 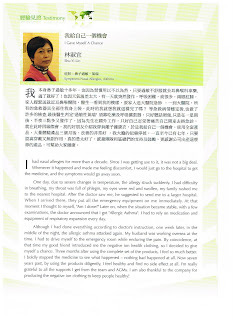 Below is her sharing, click on the picture to read her sharing in mandarin. "...I had nasal allergies for more than a decade. since i was getting used to it, it was not a big deal. whenever it happened and made me feeling discomfort, i would just got to the hospital to get the medicine, and the symptoms would go away soon. one day, due to severe changes in temperature, the allergy struck suddenly. I had difficulty in breathing, my throat was full of phlegm, my eyes were red and swollen, my family rushed me to the nearest hospital. after the doctor saw me, he suggested to send me to a larger hospital. When I arrived there, they put all the emergency equipment on me immediately. At that moment i thought to myself, "Am I done?" Later on, when the situation became stable, with a few examinations, the doctor announced that i got "Allergic Asthma". I had to rely on medication and equipment of respiratory expansion every day. Although I had done everything according to doctor's instruction, one week later, in the middle of the night, the allergic asthma attacked again. My husband was working oversea at that time. I had to drive myself to the emergency room while enduring the pain. By coincidence, at that time my good friend introduced me to the negative ion health clothing, so I decided to give myself a chance. Three months after using the complete set of the products, I feel so much better. I boldly stopped the medicine to see what happened - nothing bad happened at all. Now seven years past, by using the products diligently, I feel healthy and find no side effect at all. I'm really grateful to all the supports I get from the team and AGMs. I am also thankful to the company for producing the negative ion clothing to keep people healthy!" Do you know of anyone who are enduring such pain and would like to do something about it? Do share this testimonial with them and I am more than happy to share more information with you or your friends.